The basic rule with one true loves are that they are not attainable or realistic in anyway. These can (and should) include characters (from any media: film, tv, fiction – and shouldn’t just be based around one actor if possible), cartoons, people circa not-this-time, and just generally people you don’t actually know and probably will never know. Oh. And you should have no less than 5. I actually got a chance to see him live. Only briefly (due to my friend wanting to leave, she drove… I wasn’t happy). Anyway. 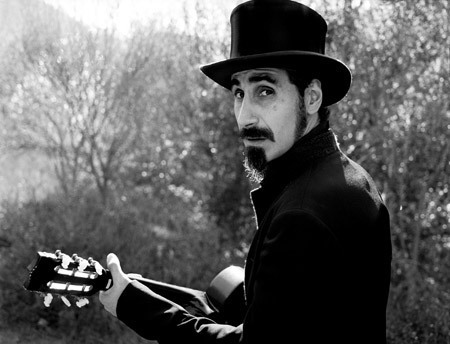 Ozzfest: and I got to see Serj dancing around, singing with his amazing voice. I do basically have to thank an ex from high school for introducing me to System of a Down. I thoroughly enjoy his music, and I’m pretty amazed by him in general. Also, I just want to say, BYOB is actually really challenging on Guitar Hero. I just found him amazingly amusing and ohso entertaining… plus, the whole musician thing… Definitely my favorite part is John in the tub. A lot of people tend to choose John or Paul as favorite Beatles… Sometimes Ringo (gotta love Mr. Conductor). But well, it was completely John’s personality in this film that wooed me. .. Well, George has pretty much always been my favorite Beatle. And well, George on the car was pretty funny… I don’t know, I just enjoy him overall. Maybe I like the quite ones. Who knows. His son, Dhani, is also attractive though. Yep. Not even “Johnny Depp as…” It’s just Jack. Possibly one of my favorite characters. Don’t get me wrong, Johnny Depp is hot too… but well, Jack Sparrow is just awesome. Who wouldn’t be attracted to this dirty and hilarious pirate? We definitely have at least rum in common. And well, maybe I have a soft spot for flailing. Like most people, I first found out about Keith Nobbs (the actual person) via The Black Donnellys. It was a great show, and I’m upset it got canceled so quickly. But at least I own all 13 episodes on dvd. I mean, this cast has some hot guys in it… but as the unreliable narrator, Joey’s just awesome. At least, well, I was sold. 5. Sayid, Sawyer and Boone. Okay. So I can’t just pick one from Lost. I’ve stopped watching the show, but I still find these men attractive. I think it goes back to something similar with Jack Sparrow, this literally dirty aspect to these men… for some reason the scruff and sweat make them hotter. The only slightly weird thing is that Boone does look a lot like my friend Kyle Dean… but I will admit, Kyle Dean is an attractive man and ladies love him. (And boys too.) Lastly, if you haven’t see Bride and Prejudice… you should. Especially if you are Sayid fans…. Yep, from a Lost obsession to a Heroes obsession. Adam Monroe, though arrogant and well vengeful, was awesome. And I was definitely sadden at his pathetic death. Seriously, they could have done better. I only barely like Peter. Something about him with his shirt off I guess. And well, Sylar… he amuses me too. And I am happy they’re trying to give him more depth. heck ALL of Serenity’s crew. Anyway. Indeed a good show. Indeed awesome. And the writing was just great. Anyway. 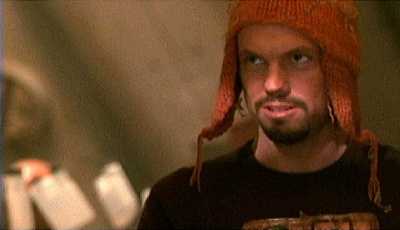 You’ve also got to love Jayne’s hat. And Wash. Who doesn’t love Wash? Okay, so he’s creepy and evil… not the first time I’ve had that on this list. But maybe it’s just how Johnathan Rhys Meyers portrayed him… There’s a definite romantic element to Steerpike… However, I wonder if I would like him as much in the books. I do have them — all three Gormenghast books. Reading them is another issue. Peake is quite the writer… long detailed prose… It’s just a bit too much for me right now. Yeah. I don’t know why. I’ll accredit this one to Smith’s writing. Oh, I will say this. Clerks I or the Animated Series only. I’m not a huge fan of Clerks II at all. Most of Smith’s later stuff has just been to keep pushing further — all about the shock and awe. And well, the amazing writing from his earlier works just isn’t there. Okay. So I’m a Cubbies fan… or at least I was born one. I really don’t watch baseball all that often.. and well, I didn’t really follow it too closely this year. I’m all for going to see a game though (which is pretty much true for any sport). Anyway. I noticed Reyes a while ago… and well, I cheered for the Mets for a bit… what? He’s hot. MC Frontalot, JT, Jermaine, ok Bret too, Heath (*sigh*), and for a short time Ryan Nyquist, Mouse (Matrix) and Jason Mewes. I’m sure there are others. .. but I’m okay with this for now.